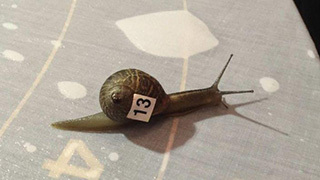 There was a slow surge of disappointment after an English pub cancelled a charity snail race scheduled for last weekend. The reason for the postponement: unseasonably icy weather made potential competitors too slow to compete. And nobody wants to watch a slow snail race. “The cold snap has led to a medical problem with our racing snails -- it’s called hibernation,” the Dartmoor Union Inn in southwest England said on its Facebook page. Temperatures across much of Europe have been below normal for the time of year, and British weather forecasters foretold bitterly cold winds and snow for this week. England’s public health authority said the prolonged cold weather posed a danger to elderly people and young children. Snails were not mentioned. Perhaps because they’re just slowly chilling. The Dartmoor Union Inn said it planned to reschedule what it had billed as “The 1st International Snail Grand National,” in aid of a local air ambulance service, once the weather warms up. Then you’ll see some snails moving.